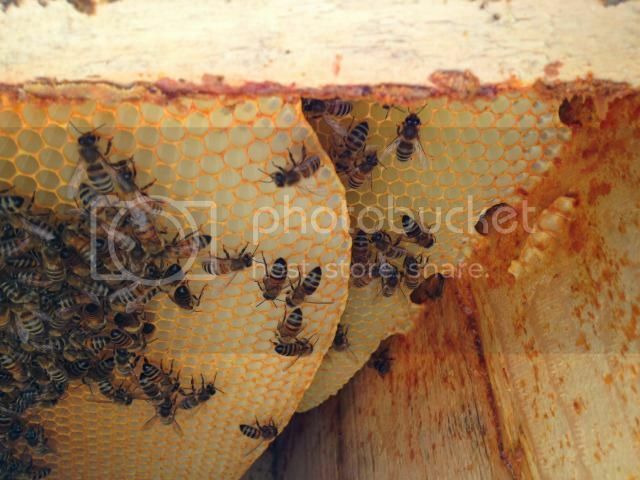 I've found many websites giving recipe on how to make some kinds of mixes with propolis, but none that I've found said anything about mixing raw propolis with honey. Is it possible to mix it and make a relatively homogeneous mass? I have never heard of it but when I crush'n'strain my honey combs there is always slight propolis taste in the honey becaususe the bees coat cell edges with propolis and when you crush it the honey rubs against it and wax too so the taste in my opinion is much better than the extracted honey. Yeah, but if I scraped some excess propolis from the walls, how can I mix it with already crushed&drained honey? Also - if I understood correctly, bees can't recycle wax, right? Can they recycle propolis? if I understood correctly, bees can't recycle wax, right? Can they recycle propolis? They can recycle wax, though usually don't. The sound these girls were making was 'snap. crackle and pop' as they chewed away a nice tasty mouthful from the polythene. They've been doing this for the last 2 or 3 days - much easier than flying some distance to find it. I guess you could do an alcohol extract and then use that to blend with your honey (Im assuming for medicinal purposes?) It takes quite a high ETOH percentage to extract the propolis though. Probably a newbie question, but why would we want to mix honey with propolis? Indeed. Mixing a propolis tincture (propolis extracted via alcohol) with honey is a viable option.